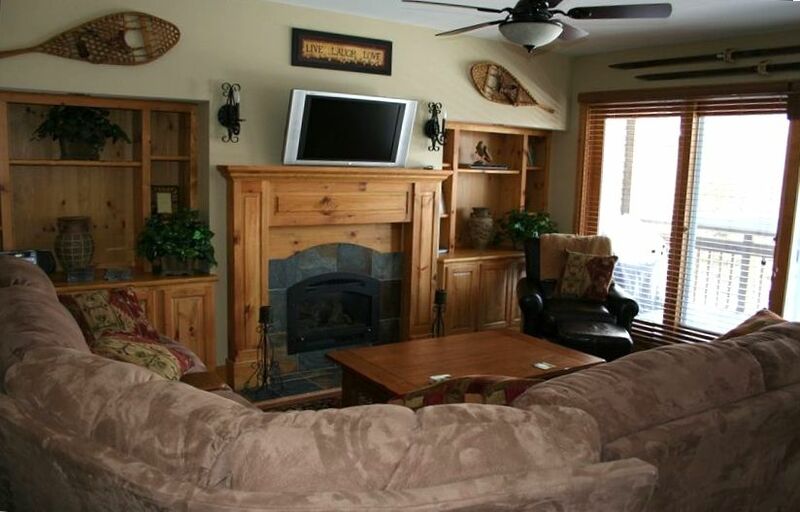 Beautiful luxurious two bedrooms, two bathrooms ski-in/ski-out condo sleeps five to seven people,includes lots of upgrades like granite kitchen, flat screen TV and satellite, wood floors, slate gas fireplace and exquisitely furnished. Master bedroom includes king size bed and master bathroom, second bedroom has a double bunk with a single on top, and there is a pull-out sleeper in the living room. Jay Peak gets more snow than anywhere else in the Northeast with miles of gladed terrain, incredilbe snowfalls and spectacular views. Jay was voted the #1 ski area in the East by skiing magazines. This is a family friendly resort with lots of activities for the whole family throughout the year. Located about 1/2 mile up the hill from the new Graham Cooke 18 hole Championship golf course with spectacular views of the Peak and surrounding mountains. Walking distance to the new indoor Ice Rink and indoor Water Park. Other on-site activities include hiking, swimming, biking, skating, indoor rock climbing and fitness center and spa. We are an avid ski family who have been skiing at Jay for the past 20 years. Jaypeak is our home away from home with incredible memories through the different seasons. It is a magical place that wants you coming back. Directly off the Grammy Jay trail. Walkimg distance to the Hotel, waterpatk,spa, golf course. Happy to hear that you enjoyed your stay. It was great having you as guest. Hope to see you again soon. My family had the best time at this Jay Peak condo! So convenient to ski on and off the Grammy Jay trail! The condo is clean and cozy! The owner Rose is so nice and easy to work with! I would absolutely recommend renting this beautiful condo!! Thank you Pam for the kind words. Happy you had a great time. Jay is a magical place. Looking forward to hostng you again soon. Just got home from our 2 night stay. Everything was as advertised and very nice! The ski in /ski out feature is the best. we even came back for lunch! Happy to hear you had a great stay in my condo. The convenience of ski on ski off is hard to beat. Hope to see you again soon. We had a wonderful President’s weekend 2019 getaway at Rose’s fantastic Jay Peak condo. 2nd to corner unit so there are great almost 360 degree views of the ski in/out trail from all windows. Last stop on the trail before the lift and a quick ski down to Stateside Lodge. This condo has it all including all the necessities such as dishes, coffee maker, toaster, towels etc. all we needed was food, ski gear and clothes. Safe and family friendly resort, felt comfortable letting the kids venture off on their own (pre-teens) as well as provided a great family experience. Exceptional ski conditions as it is located just a few miles from the Canadian boarder; we had snow and sun every day of our stay. Tons of nearby activities on the resort will keep your family busy for a week! So sad to leave and can’t wait to come back again VERY SOON. We highly recommended staying at this wonderful condo. Thank you Rose and family for allowing us to stay at your beautiful place and for being available for questions/ making it an easy stress free stay!!! Very happy to hear that you enjoyed your stay in my condo at JayPeak. Thank you for taking care of my home like it was your own. You were an excellent guest to host and hope to see you again soon. Clean, Bright and Comfortable Condo directly on the Grammy Jay Trail. Good communication with owners and our family really enjoyed the stay. Your positive review is greatly appreciated. Happy to hear you enjoyed your stay. The convenience of Ski on Ski off is hard to beat. Thank you for treating my home like it was your own. Had a fabulous stay at this beautiful condo! Renters were so helpful with all details related to the stay. Would absolutely rent this property again! Happy to hear you enjoyed your stay in my condo at JayPeak. It would be a pleasure to have you as a guest again in the near future.